MODFLOW 6 is the latest version of the groundwater modeling code MODFLOW developed by the USGS. This version includes some innovate tools and a complete rearrange of the model construction, but to date this code doesn’t have any commercial / open source Graphical User Interface (GUI) that improve the code usage for beginner and intermediate groundwater modelers. This tutorial requires some Python core libraries, Numpy, Matplotlib and Flopy. The folder for the model files and simulation output is defined as well as executables for the triangular mesh generator and Modflow 6. The active model domain is a trapezoid with the smaller parallel side located at the model east side. The drain was conceptualized as a rectangle on the center left part of the model. We use the Triangle tool from the flopy utils that actually implement the Triangle program to generate meshes. This tutorial comes with the Triangle executable for Windows, if you use another operating system it is needed to compile the source code that you can find from https://www.cs.cmu.edu/~quake/triangle.html. By using the available methods for the triangle object "tri" we can represent the vertex and the centroid with their position and label. Once we have the triangular mesh we can create a MODFLOW 6 model. As you might know, MODFLOW 6 has a difference in between a model and a simulation since it implements the concept of exchange in between models. A simulation can have many models, for this case we have a simulation of just one model. MODFLOW 6 differenciates the spatial discretization file and the temporal discretization file. 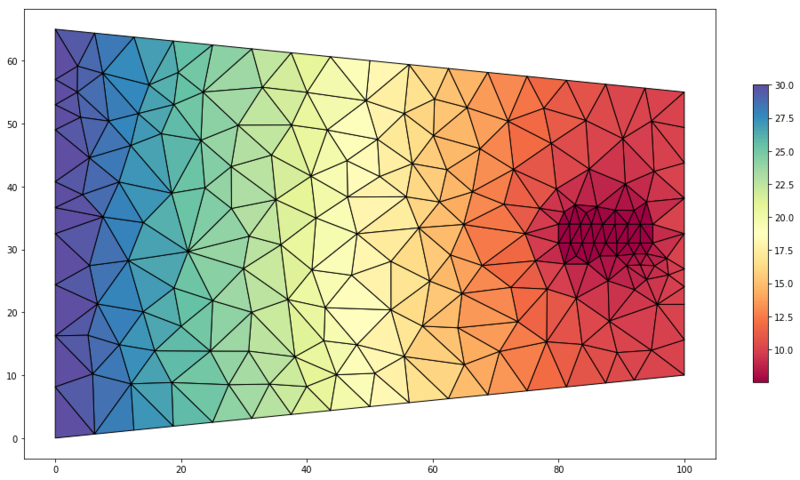 On the spatial discretization options we have three grid types: regular (.dis), triangular (.disv) and unstructured (*.disu). This study case uses a triangular discretization. The left and right sides of the model were defined as CHD boundary condition to represent a regional flow right to left from an hydraulic head of 30m to 10m. 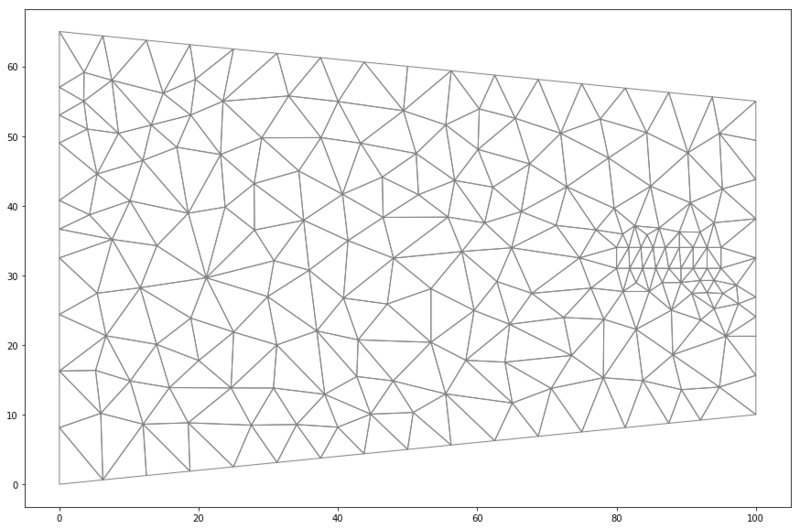 See that the edge vertices are obtained from the model grid edges. At the center left part of the model there is a drain conceptualized as two lines on the border from a previously declared region. The drain has a elevation of 2.5 meters lower that the eastern constant head boundary. The tutorial defines the data type that will be stored and the records on the listing file. Then Modflow 6 model files are written on the model folder and simulation is performed. We import the computed heads and represent them on the model extension. 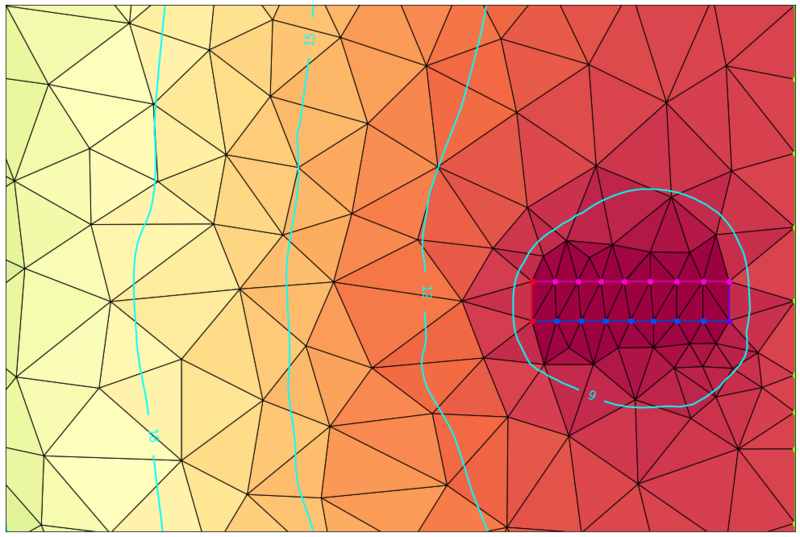 A representation of the head equipotential is done by the interpolation of heads at each cell centroid.